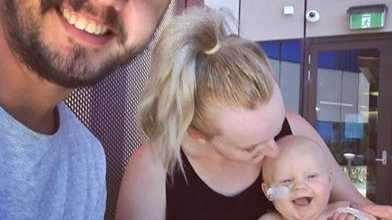 TWO weeks after contracting meningococcal, a five-month-old Brisbane boy is under going his fourth surgery. Archer Roberts contracted the deadly disease on November 10 and was rushed to Ipswich Hospital before being transferred to Brisbane's Lady Cilento Children's Hospital. His mother, Katelyn Galea said she is unsure about how many surgeries Archer has left but hopes they will do skin grafts today. 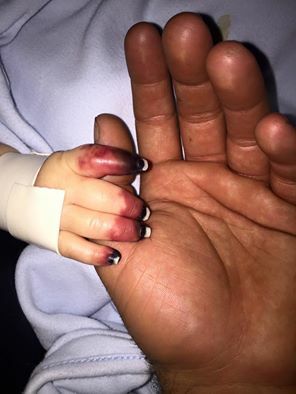 It is expected a few of Archer's finger tips and ends of his toes will self amputate. But this is good news considering doctors didn't think Archer would survive. 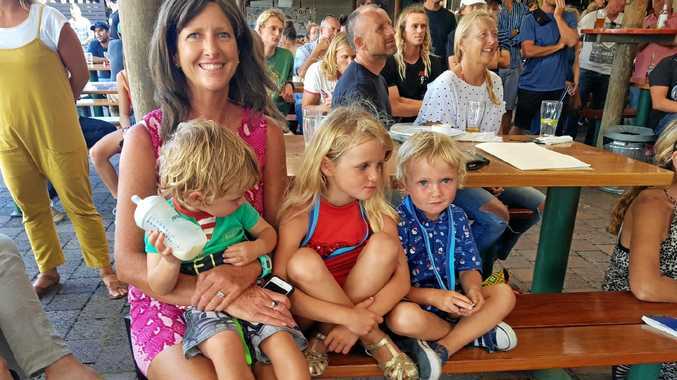 "Archer only had a 20% survival rate...once we rushed up to Paediatric Intensive Care the look on the doctors and nurses faces said it all, they did not think Archer would survive the night but he did," Ms Galea said. The devoted mother has written a heartfelt post about the day Archer got sick on Facebook. She has given ARM permission to reproduce this post. Have you ever imagined what your worst nightmare would be? When you become a parent you feel instantly sick at the thought of anything happening to your children. You do everything in your power to ensure they are safe 24/7! It was Thursday, November 10 and Archer woke at 0530 which is normal. He woke a happy baby, giggling and talking and played on the floor for an hour before his morning nap. Waking up from his nap he was very unhappy, wouldn't eat and just cried. I put him in the pram and took him outside where he was falling asleep but moaning, after 2 hours I noticed he was boiling hot so I took him straight to the shower (where usually he loves it) but he screamed. Josh and I made the decision to take Archer to our usual doctors at Brookwater where we were seen and sent home as Archer had a likely ear infection. From about 12pm Archer declined rapidly, he slept all afternoon and when touched he screamed. It was around 3:30pm when I noticed Archer's lips turning grey, when I called Josh in to look his lips had turned purple. We made the decision to head back to the doctor because something was not right! On our drive I sat in the back to make sure Archer was ok, about 10 minutes into our drive he was struggling to move and lips were getting darker which is why we drove straight to Ipswich hospital. There was a lovely lady waiting at the door of Emergency for Archer where she took my hand and ran with me to a bed, that's when I placed Archer down and noticed two tiny red dots on his chest and I knew instantly how sick my baby was. The social worker came and got Josh and I and placed us into a tiny room. Every 10 minutes they would come back with an update of "your baby is very very sick" that's all we heard for hours. Every so often Josh and I would go in and see Archer, there was a crowd of doctors, every doctor and nurse possible was working on Archer to keep him alive. They then told us Archer was not stable enough for transportation to Lady Cilento where they then placed Archer on life support. Once being place on life support Archer only had a 20% survival rate. At 10:30pm they finally stabilised Archer enough to transport him, with lights and sirens we got to LCCH within 10-15 minutes. Once we rushed up to Paediatric Intensive Care the look on the doctors and nurses faces said it all, they did not think Archer would survive the night BUT he did! A Go Fund Me account set up to raise funds for the young family has exceeded the $5000 target. More than $13000 has been raised by 300 people in 16 days. EARLIER: A FIVE-MONTH-OLD Brisbane boy is in hospital after contracting the deadly meningococcal disease. Archer Roberts' mother Katelyn Galea told ARM he is having surgery today to clean and dress his legs, left arm and burn on his stomach/hip. Thankfully, he is expected to make a full recovery. "He will lose a few finger tips and end of toes but they self amputate. 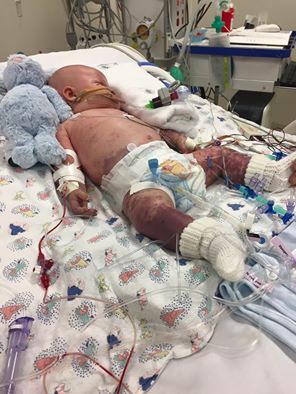 "He needs a skin graph next week because when they drilled into his hip to get fast excess for fluids it wasn't in all the way and it leaked into his skin and burnt," Ms Galea said. But Archer still has a long road ahead of him. Ms Galea said while it hasn't been confirmed, he could be in hospital for months yet. "Which is fine anything for Archer but life does still go on and bills still accumulate." A Go Fund Me account set up for the couple has already raised over $9000 in four days, smashing the $5000 target. Something Ms Galea and her partner Josh Roberts can't comprehend. "Isn't it amazing! Gosh, Josh and myself can't even comprehend it, we are so so thankful," she said. Ms Galea and Mr Roberts initially rushed Archer to Ipswich Hospital on Thursday with a "fever, moaning and unsettled with grey/ purple lips", Ms Galea said. "That was around 11am which he only had fever and moaning. Come 3:30-4pm his lips were changing colours and he wouldn't wake he was very lethargic." Ms Galea said they took blood for the DNA testing but it wasn't until Friday morning that it was confirmed, little Archer had menigococcal. "His body broke out in the purple rash, his heart rate was through the roof, his blood pressure was very, very low. "He was put on life support. "He only had a 20% survival rate." Archer was then transferred to Brisbane's Lady Cilento Children's Hospital where he was given a blood transfusion. 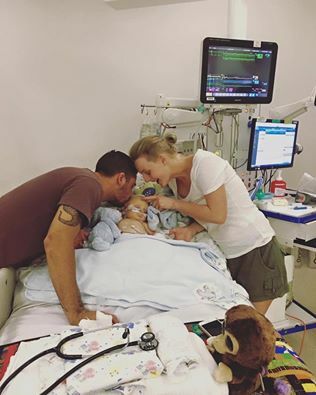 Later that evening, Archer's father Josh Roberts took to Facebook to write about the horror of discovering his precious five-month-old son contracted the deadly meningococcal disease. "Meningococcal. You hit my son yesterday like a wrecking ball but he came straight back at you like a d11 bulldozer," Mr Roberts wrote on Facebook on Friday night. "Meningococcal. You have met your match. Arch is going to beat you and he is going to come out on the other side with a big smile on his face. "Any parents that had have had sick kids and experienced what Katelyn and I are going through at this time I feel for you. This is one of the hardest times I have ever had to deal with. I have never ever loved something, someone with such passion and love," the devastated father wrote. "You are a strong little man Arch just keep on fighting. You will get through this." Earlier that day Archer had been taken off some of the medication and had started functioning "somewhat by himself". "Which is a very positive sign. He is getting better, very slow," Mr Roberts wrote. Since Saturday the young battler has been showing signs of improvement. On Monday, Ms Galea posted a video of her son opening his eyes. "My baby is waking up!!!!!!!!! Archie, mummy and daddy couldn't be any more prouder. You are the true definition of a fighter. I love you," Ms Galea wrote. And on Tuesday, Archer was taken off life support, an answered prayer for his parents. "So for all you guys who have been praying for Archer it has worked he is now off life support and starting to look around and be a lot more responsive which is great news," Mr Roberts wrote on Facebook. "The bug is completely gone out of his system he just has to fight the side effects now." Mr Roberts thanked everyone for thinking of Archer and asked people to keep the "little trooper" in their prayers. He also thanked everyone who has donated to the Go Fund Me account. "A big thanks to everyone who has supported us and donated to the Go Fund, Katelyn and I will forever be in your debt. We truly do appreciate this thanks guys so much," he wrote.